Holy basil (Ocimum tenuiflorum) is an herb closely related to culinary basil (Ocimum basilicum). Originating in South Asia, holy basil is often referred to as tulsi and traditionally used for its medicinal benefits. Holy basil can suffer from certain pests, but with companion planting, a method of planting that groups certain plants together for optimal growth and pest control, these pests can be repelled. In warmer climates, holy basil is a perennial. In cooler climates, an annual. Holy basil grows best in U.S. Department of Agriculture plant hardiness zones 7 to 10. The most-threatening insect to the holy basil plant is the aphid, a small insect that attaches to leaves of the plant, eventually sucking through, leaving holes. Specific herbs can help ward off aphids from your holy basil plants. Chives (Allium schoenoprasum) are a perennial herb from the onion (Allium cepa) family and a natural aphid deterrent. Planting chives around your holy basil can keep the aphids away. Other aromatic and strong-flavored herbs such as cilantro (Coriandrum sativum) or mint (Mentha) can also be effective at keeping aphids away, making them great companion plants for holy basil. Also, planting holy basil and lemongrass herb (Cymbopogon citratus) together can help keep mosquitoes away. 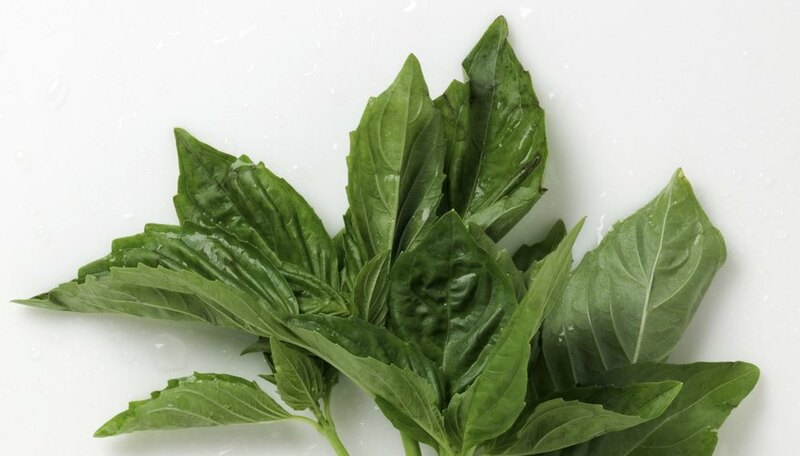 Planting basil near specific vegetables can be helpful in protecting the vegetables from harmful insects as well as promoting their growth. Potato (Solanum tuberosum) and tomato (Solanum lycopersicum) plants both benefit from holy basil companion planting. Planting holy basil near potatoes will help ward off potato beetles, a harmful insect that lays eggs quickly and eats or destroys the crop. Tomato plants planted next to holy basil will be healthier and produce more fruit. If companion planting isn't keeping aphids away from your holy basil plants, use other methods to control them. If you only have a few plants, you can manually wipe the aphids off the leaves. You can also bring beneficial insects into your garden such as ladybugs, which will eat the aphids out of your garden. A homemade aphid pesticide can also be made from tomato leaves or garlic oil.